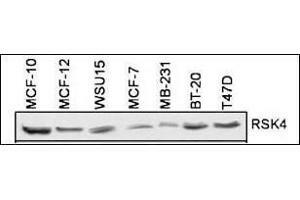 RSK4 Antibody (N-term) (ABIN1882127) is used to detect RSK4 in 7 different cell lines. Data courtesy of Dr. Yuan Sun, Hormel Institute, University of Minnesota. 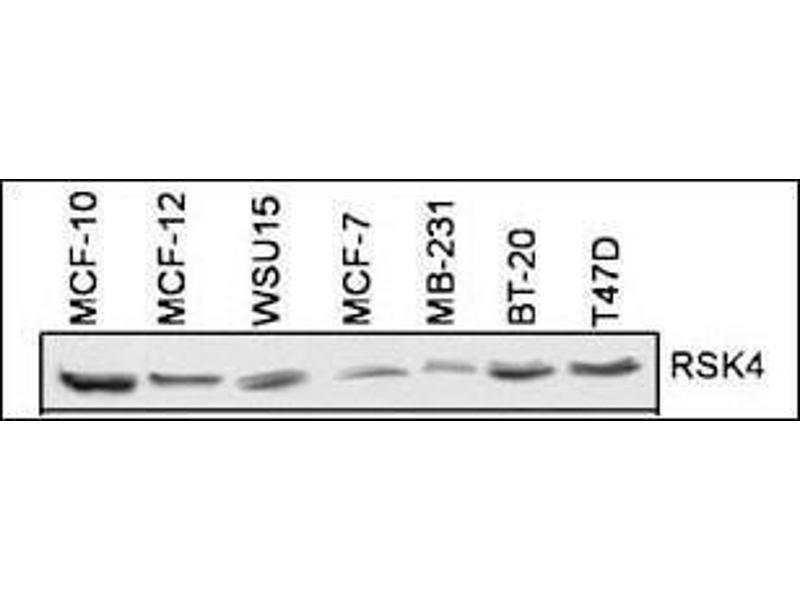 免疫原 This RSK4 antibody is generated from rabbits immunized with a KLH conjugated synthetic peptide between 15-45 amino acids from the N-terminal region of human RSK4. 背景 Protein kinases are enzymes that transfer a phosphate group from a phosphate donor, generally the g phosphate of ATP, onto an acceptor amino acid in a substrate protein. By this basic mechanism, protein kinases mediate most of the signal transduction in eukaryotic cells, regulating cellular metabolism, transcription, cell cycle progression, cytoskeletal rearrangement and cell movement, apoptosis, and differentiation. With more than 500 gene products, the protein kinase family is one of the largest families of proteins in eukaryotes. The family has been classified in 8 major groups based on sequence comparison of their tyrosine (PTK) or serine/threonine (STK) kinase catalytic domains. The AGC kinase group consists of 63 kinases including the cyclic nucleotide-regulated protein kinase (PKA & PKG) family, the diacylglycerol-activated/phospholipid-dependent protein kinase C (PKC) family, the related to PKA and PKC (RAC/Akt) protein kinase family, the kinases that phosphorylate G protein-coupled receptors family (ARK), and the kinases that phosphorylate ribosomal protein S6 family (RSK). The calcium/calmodulin-dependent kinase (CAMK) group consists of 75 kinases regulated by Ca2+/CaM and close relative family (CAMK, CAMKL, DAPK, MAPKAPK). 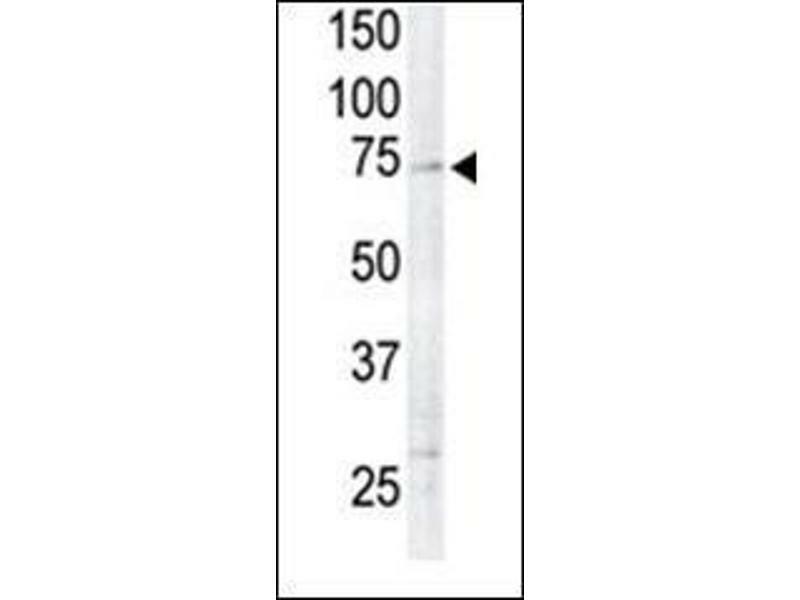 缓冲液 Purified polyclonal antibody supplied in PBS with 0.09 % (W/V) sodium azide. 注意事项 WARNING: Reagents contain sodium azide. 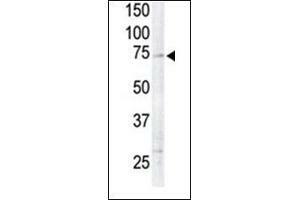 Sodium azide is very toxic if ingested or inhaled. Avoid contact with skin, eyes, or clothing. Wear eye or face protection when handling. If skin or eye contact occurs, wash with copious amounts of water. If ingested or inhaled, contact a physician immediately. Sodium azide yields toxic hydrazoic acid under acidic conditions. Dilute azide-containing compounds in running water before discarding to avoid accumulation of potentially explosive deposits in lead or copper plumbing.